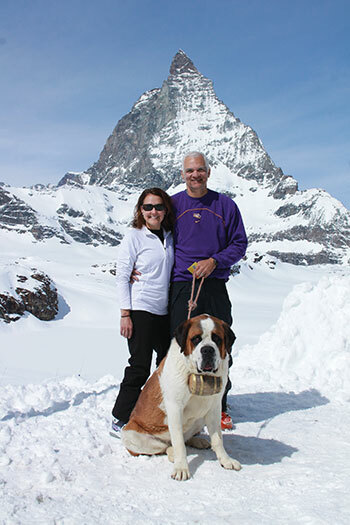 Allyson and Ronnie Morris brought their LSU spirit on a ski trip in northern Italy, where they met a canine friend. Behind them is the Matterhorn, bordering Zermatt and Cervinia. Ronnie and Allyson Morris know hard work. Before they ever dreamed of laying the flooring in the beautiful Baton Rouge home they built themselves, each worked their way through LSU—Allyson maintaining a perfect GPA while balancing multiple jobs, and Ronnie raising two children as a single father who worked full time and was a full-time engineering student. He received an LSU Board of Supervisors Scholarship two consecutive years after writing Rolfe McCollister Sr. to explain his situation. Now 19 years into his career as an engineer at ExxonMobil, Ronnie and Allyson, a supervisor at the company, are passing along the opportunity to students in the College of Human Sciences & Education. In 2001, Ronnie took advantage of ExxonMobil’s 3-to-1 matching gift program to create the Dot and Rolfe McCollister Sr. Leadership Award, Ronnie’s expression of gratitude to the people who helped him. The endowed scholarship currently supports three students each academic year. Once they have completed their pledge, it will be the largest endowed scholarship in the college’s history and will provide full tuition for four students every year. Ronnie and Allyson explained that the scholarship is based on need, leadership qualities and character, validated through a pastoral reference. “I think we honor God by trusting the pastors in our community to recognize the character and leadership skills that will inspire our kids in the classroom to be the best they can be,” Ronnie explained.